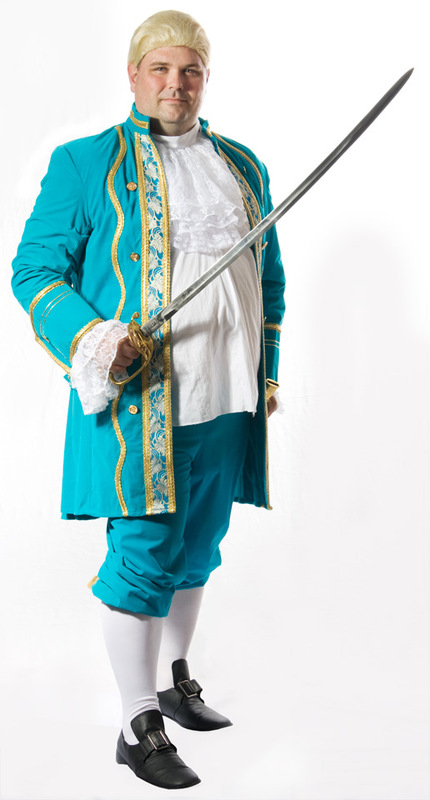 Louis XVI King of France 1774-1792. Includes: Exquisitely embroidered Antique Rose/Bisque Coat, Knickers w/side pockets & Vest/Shirt Front accented w/Brown Lace Jabot, Cuffs, Gold Button & Trim detail. Marie Antoinette Queen of France 1774-1792. 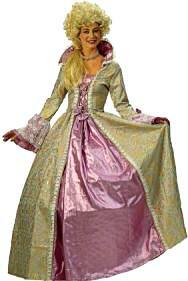 Includes: Exquisitely embroidered Antique Rose/Bisque Taffeta Gown w/fitted bodice, back zipper & elastic waist skirt. 2 pieces. Includes: Exquisitely embroidered taffetta Jacket accented with gold detailed trim, Knickers w/side pockets & Vest/Shirt Front accented w/Lace Jabot, matching lace Cuffs, Gold Button & Trim detail. Includes: Exquisitely embroidered taffetta Gown with fitted bodice accented with gold detailed trim, lacey adornment on collar & sleeve. Back zipper closure & elastic waist skirt. 2 pieces. 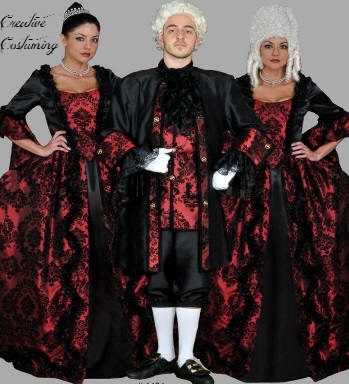 Includes: Deep burgundy/black flocked taffeta coat, matching knickers with side pockets and accented with matching vest/shirt front, black lace jabot, cuffs & gold button detail. skirt with elastic waist & side zipper. 2 piece. Plus size (14-22) B: 48"/W: 42-48"/H: 50-58"
White (left) T7710 & T7711 See below. Jabot and cuffs available separetely. 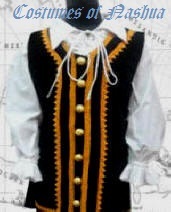 Includes: Matching Taffeta Jacket & Knickers accented with vest/shirt front. 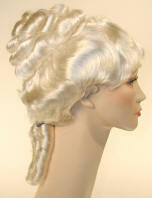 Exquisitely well made in a very fine white fiber. Champagne Blonde (22), Bright Dk Purple. 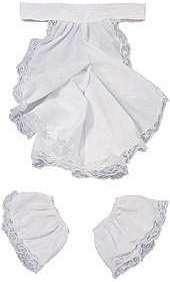 ruffle adornment at blouse, skirt front & sleeve. Back zipper. 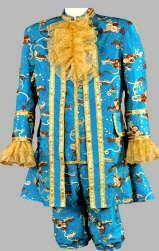 Includes: Blue taffeta Jacket & Knickers w/soutache embroidery & accented with matching jabot, cuffs & vest/shirt front. 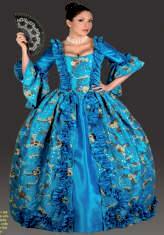 Includes: Cerulean blue and gold period two piece gown with attached lace collar and cuffs. 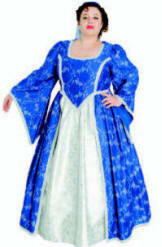 Small B: 34" / W: 26" / H: N/A"
Med B: 36" / W: 28" / H: N/A"
Includes: Blue & Rose cotton print two piece gown. 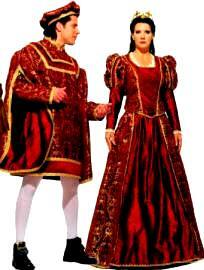 Bodice has 3/4th length sleeves ending in maroon banding & blue & maroon lace. 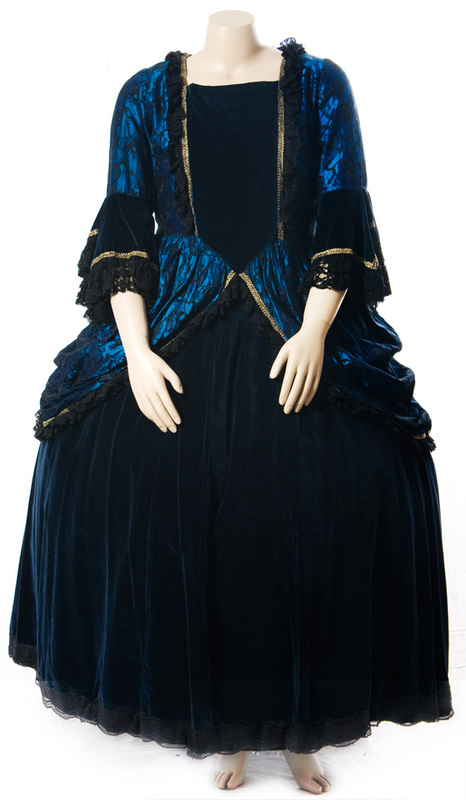 Navy satin stomacher trimmed in maroon & gold. 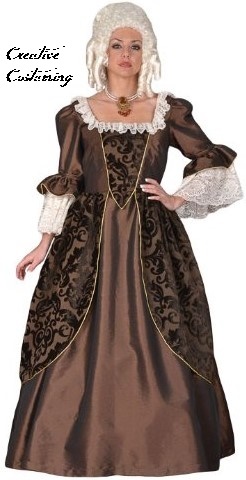 Attached overskirt in same print w/gold edged maroon trim around the neck, side fronts & skirt. Additional trim on side front of skirt. Underskirt is Blue satin w/matching trim & ruffle at hem. Bodice laces up center back (for better fit & size flexibility). 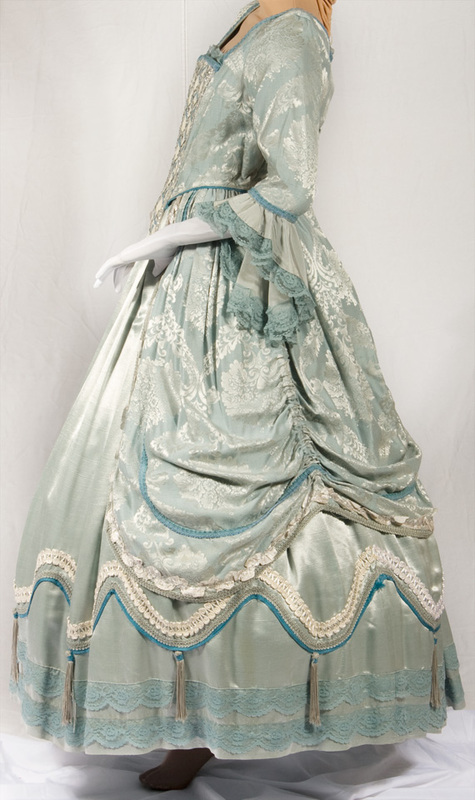 Includes: Two piece light blue brocade gown with blue & silver trim. 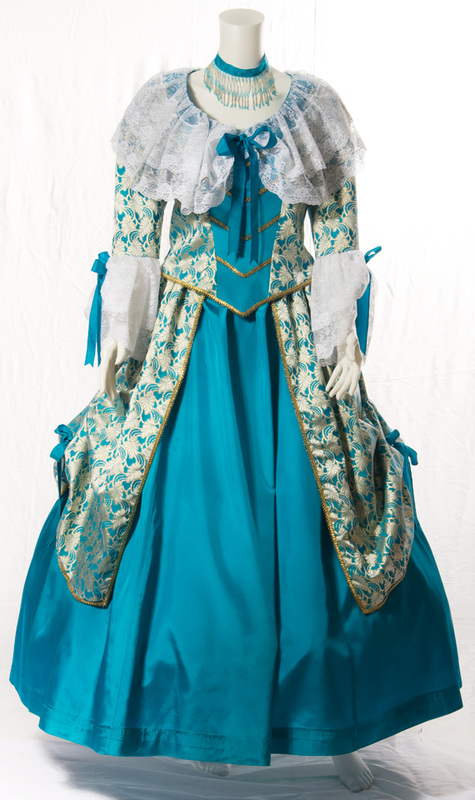 Square neck, blue white & silver diamond patterned stomacher with 3/4 length sleeves finished in a light blue faille frill with light blue lace edging. Laces up center back. Attached overskirt is draped with adjustable cords at side & back. 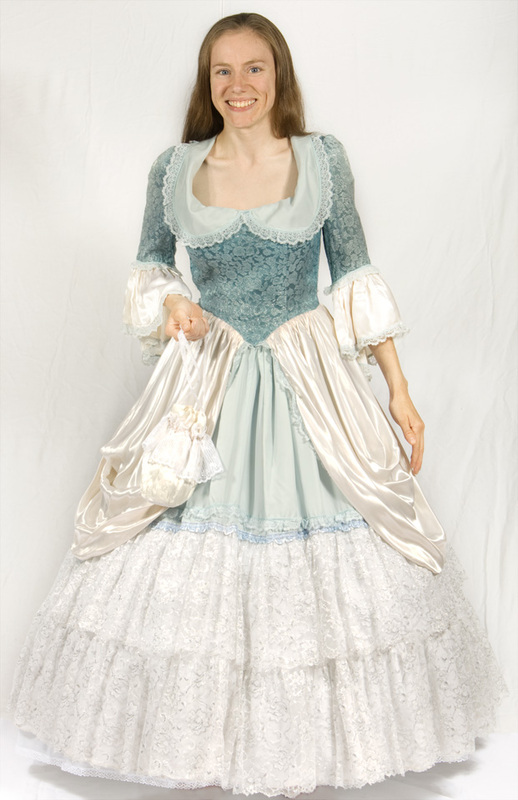 Separate underskirt is light blue faille with corded trim, tassels & lace trim at hemline. 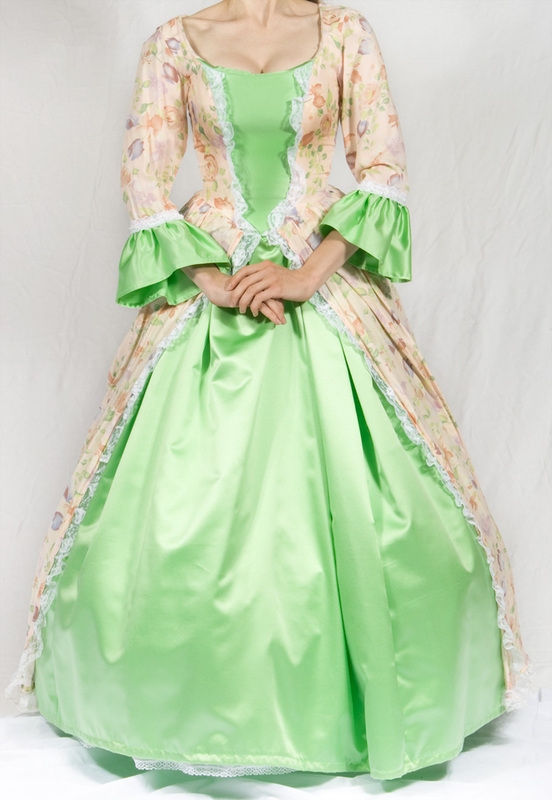 Includes: Peach flowered gown with lime green underskirt and trim. Fitted bodice has lime green center front panel edged in white lace with a cascade of white satin bows. Attached lime green underskirt has peach overskirt trimmed in white lace. 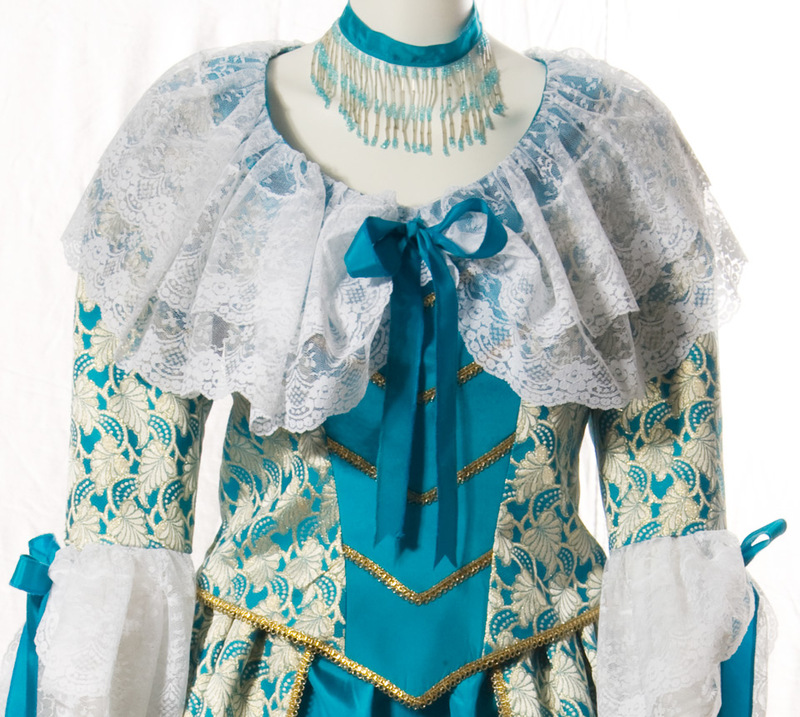 Sleeves are ¾ fitted and end in green ruffle with ribbon and lace trim. 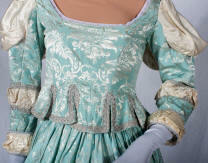 Includes: Light Blue and silver brocade bodice with fitted ¾ sleeve. 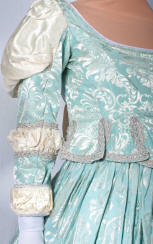 Sleeve has cream satin frill with pale blue and white lace trim. 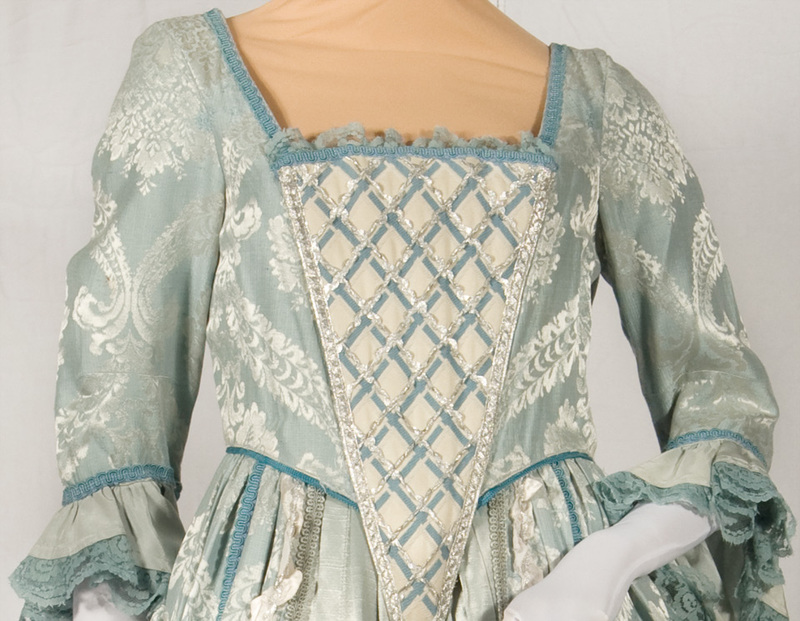 Bodice has light blue collar edged in the same lace. Attached skirt has cream satin panniers with pale blue and white trim over light blue skirt with two tiers of silver and white lace ruffle. Matching cream satin and lace drawstring purse. 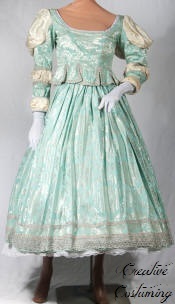 Includes: Two Piece Light green polka dotted dress with forest green underskirt and trim. Princess line bodice has square neckline with lace trim, and cascade of forest green bows down the front. Elbow length bishop sleeve has green satin undersleeve, with elastic casing and lace edging. two matching green bows either side of waist and attached light green overdrape with lace trim. 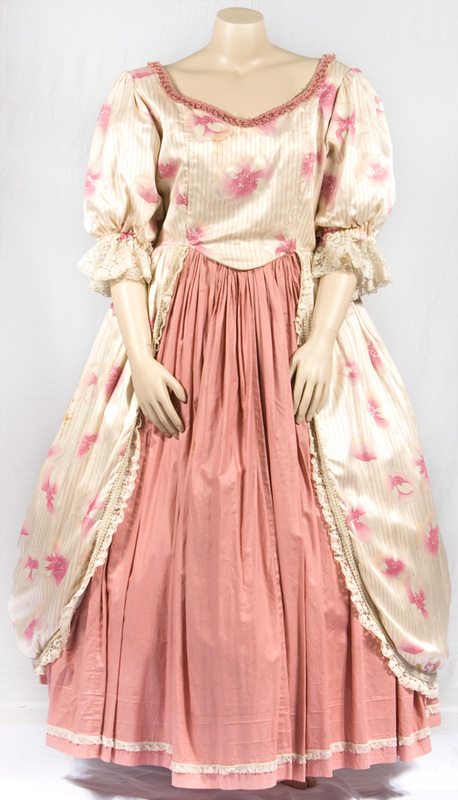 Includes: Pink and cream flowered and striped print gown with sweetheart neckline, fitted bodice and cream lace trim. Large puffed elbow length sleeves with elasticized cuff and lace trim. 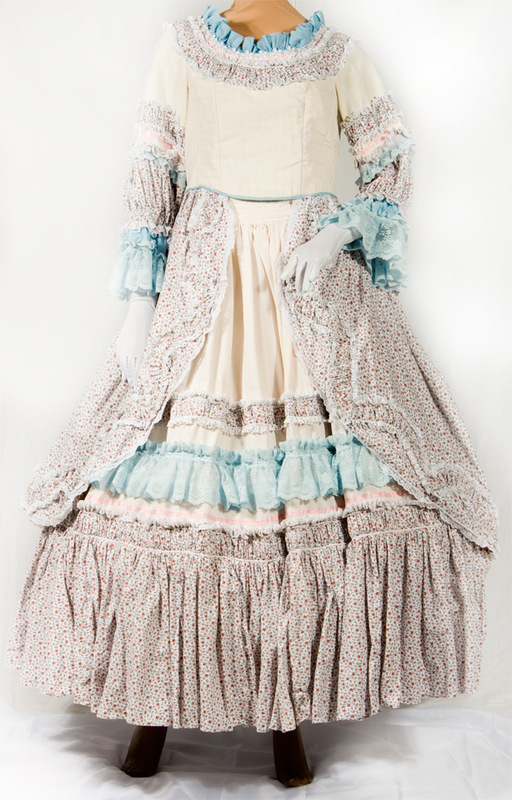 Attached skirt is Dusty Rose chintz, with the pink and cream print overskirt cut away front center front with cream braid and lace edge. 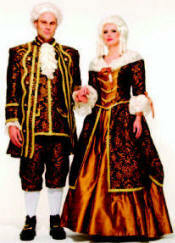 Includes: Two piece gown with burgundy brocade has gold & green floral sprig design. 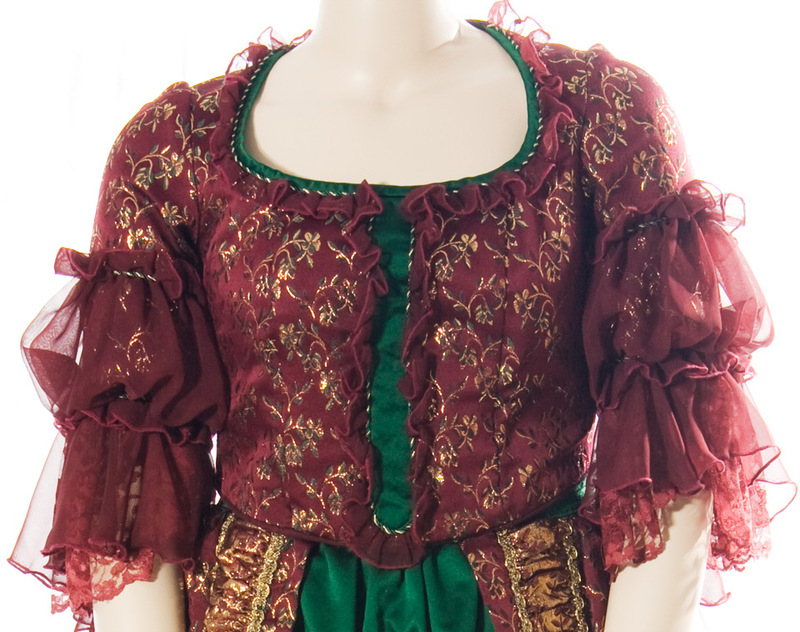 Fitted bodice has narrow green satin stomacher with green & gold braid & burgundy chiffon ruffled trim. Satin edge at squared neckline also has green & gold braid & chiffon ruffle. 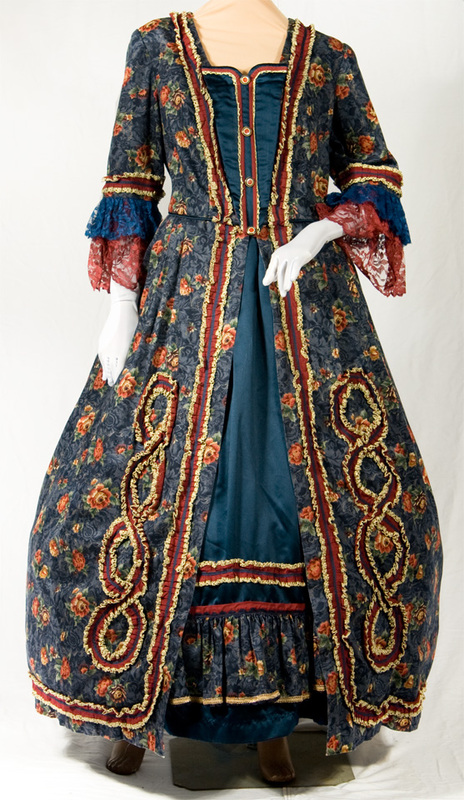 ¾ brocade sleeves has chiffon trim that is both ruched & ruffled, ending in a chiffon & lace flounce. Bodice laces up the back. Split skirt has green satin underskirt & gold & burgundy ruched trim. 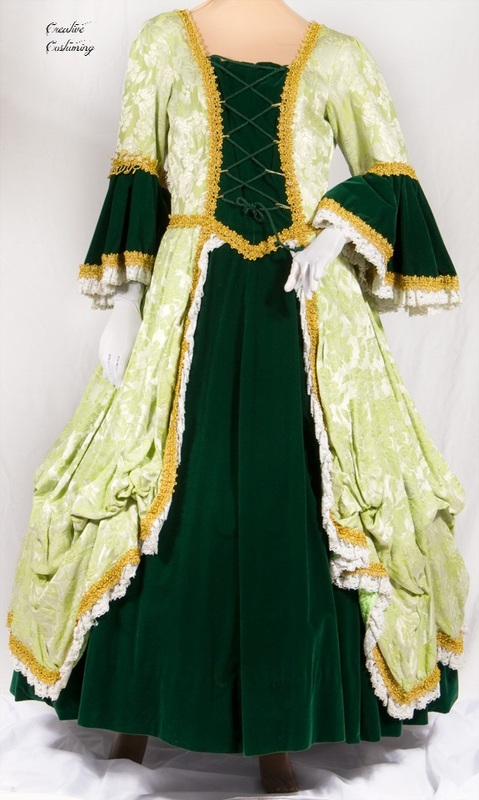 Includes: Lime green & white brocade bodice & panniered skirt with forest green velvet stomacher, flounce & underskirt. Gold trim throughout. 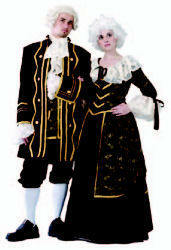 Bodice has lace up detail on stomacher, brocade sleeves fitted to elbow with velvet flounce with gold braid & lace at edge. 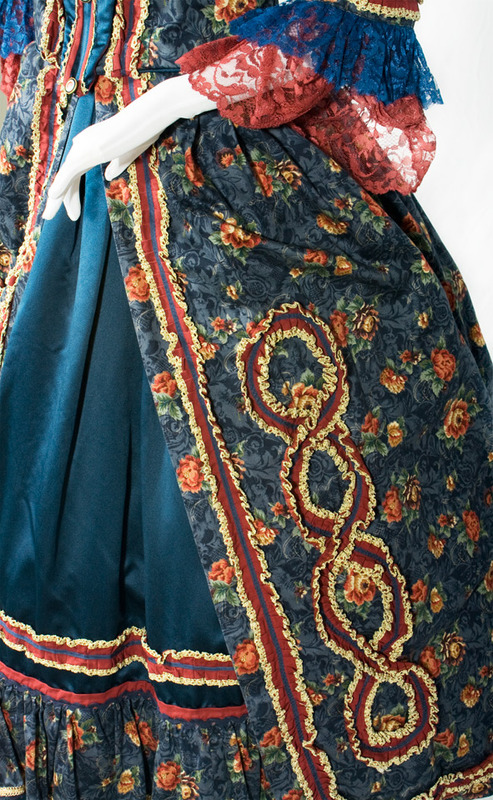 Brocade overskirt is caught up on either side & trimmed in gold braid & lace ruffle. See below for other colors available. Add $20 for hoop/crinoline rental. 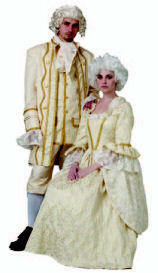 Includes: Brocade jacket trimmed with gold braid & buttons, matching solid color knickers & vest. 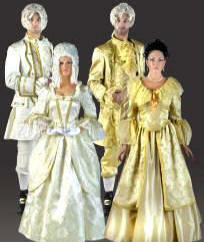 Includes: Brocade & velvet gown with overskirt & full sleeves trimmed w/lace & gold metallic braid. Includes: Brocade bodice & panniered skirt with velvet stomacher, flounce & underskirt. Gold trim throughout. 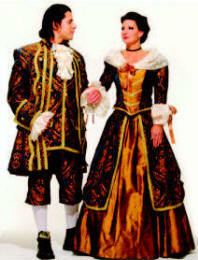 Bodice has lace up detail on stomacher, brocade sleeves fitted to elbow with velvet flounce w/gold braid & lace at edge. 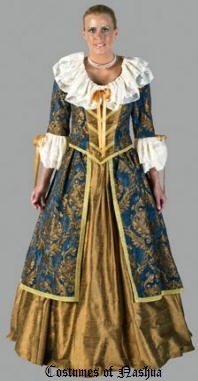 Brocade overskirt is caught up on either side & trimmed in gold braid & lace ruffle. 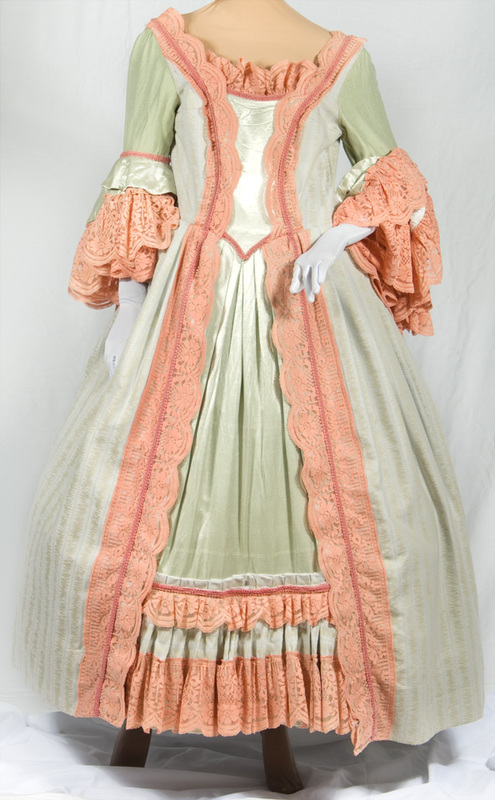 Includes: Mint Green & Salmon trim dress has pale green striped bodice & antique satin stomacher. Salmon lace & braid at neck and seams. Puffed sleeves of antique satin connect to short bell sleeve at bicep with salmon lace flounce. Attached striped split skirt has lace trim down the front & a mint green underskirt panel with ruffle trim at hem, attached to full petticoat . attached to blouse & matching mobcap. 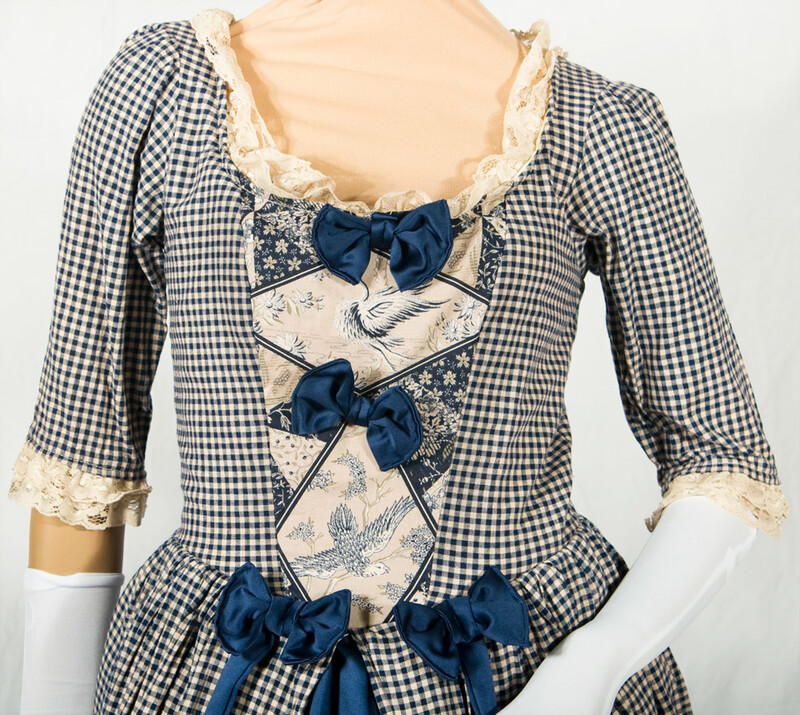 Includes: Navy & Beige gingham cotton bodice & skirt, with printed front panel & tiered bow trim. Tan lace edging at squared neckline & 3/4th sleeves. 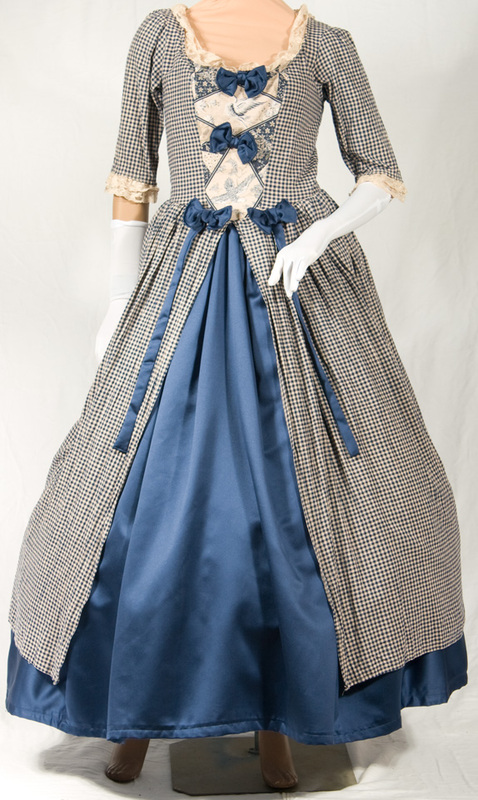 Skirt has navy blue underskirt, & matching bow trim. 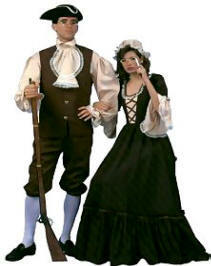 Includes: Colonial floral dress with matching floral mobcap & attached paniers all trimmed w/white lace & matching braid. 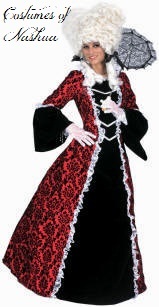 Includes: Red with black trim dress has fitted bodice, attached skirt and sleeves fitted to elbow with a black edged flounce. Black lace trim at neck and black braid trim at waist and elbow. Add $20 for crinoline rental. 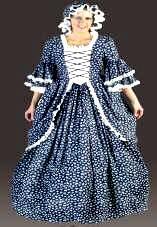 Includes: Colonial style dress with boned bodice and full skirt with built-in petticoat all trimmed with lace and matching braid. poly-cotton vest & matching knickers. Rental includes Hat, Soxes & Shoe Buckles. 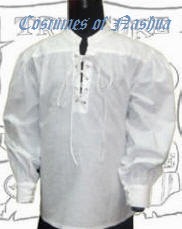 Includes: Poly-poplin dress w/poly-linen sleeves, lace & braid trim, & poly-linen mobcap. 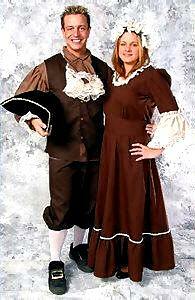 Includes: Brown shirt, brown vest, off white lace jabot, brown knickers, and white socks. picture should be re-done w/smaller petticoat. 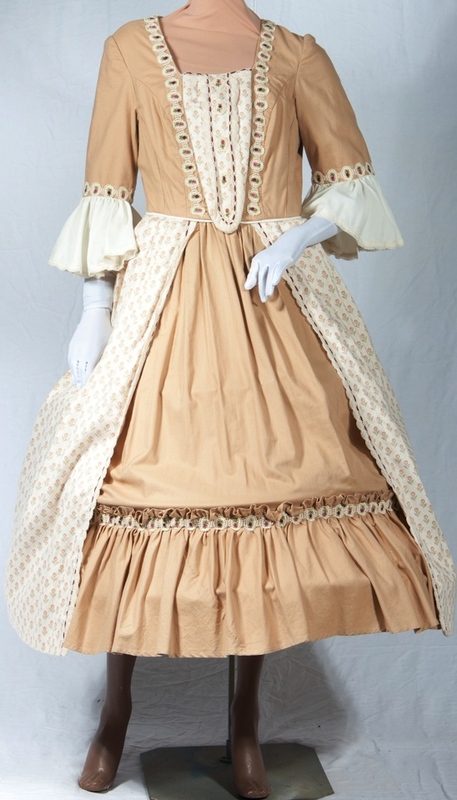 Includes: Tan broadcloth gown with brown trim. Fitted bodice with cotton ruffle at collar. Puffed sleeve over long fitted sleeve, cotton ruffle at cuff. 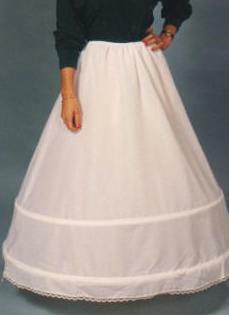 Full attached skirt, gathers at waist. Floor length. Includes: Green & beige floral striped dress with dark green accents. Empire waist bodice has green wool collar which forms a V to waist with beige cording, a dagged edge, and green stand up collar at neck. Green puff sleeve over fitted stripe sleeve have same cording & similar cutout effect, caught up in a green band at bicep. Attached striped skirt has applied green wool trim with corded edge which gives the effect of scalloped edge & is cutaway front to below the knee. Matching green wool belt & cream satin hat with green ties & feathers. Pictured with hoop. But should be worn with out hoop - picture needs to be re-done. Includes: Blouse, Skirt, Apron, Shawl & Hat. Includes: Two piece dress in cream stripe with calico & lace trim. Bodice has ruched calico neckline with blue edge ruffle & lace appliqué. 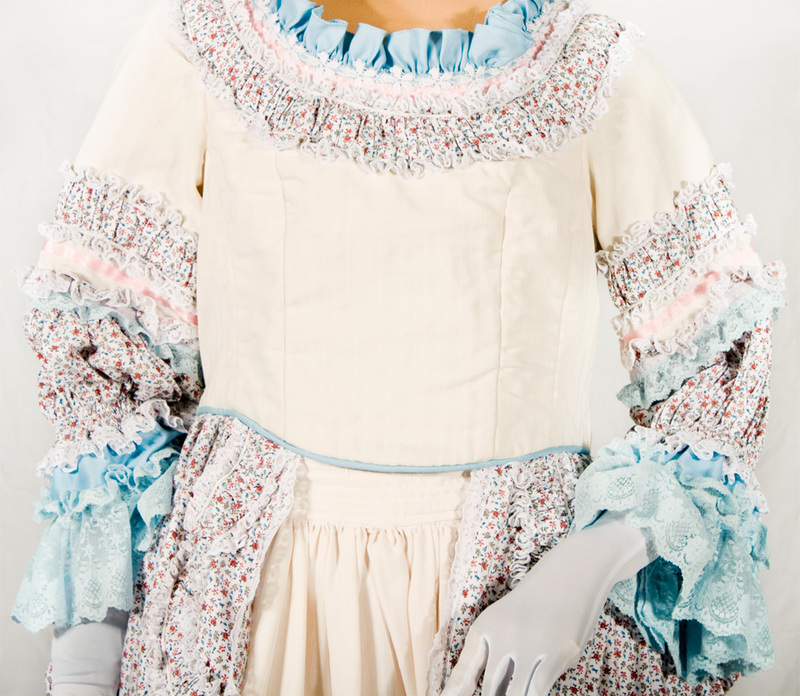 Sleeves are banded with same trim at elbow with a gathered undersleeve in calico ending in a blue lace ruffle. Bodice has panniers made of calico with ruched applied trim down the front. Skirt has bands of ruched calico, lace trim & a deep ruffle at hem. Bodice laces up center back (for better fit & size flexibility). 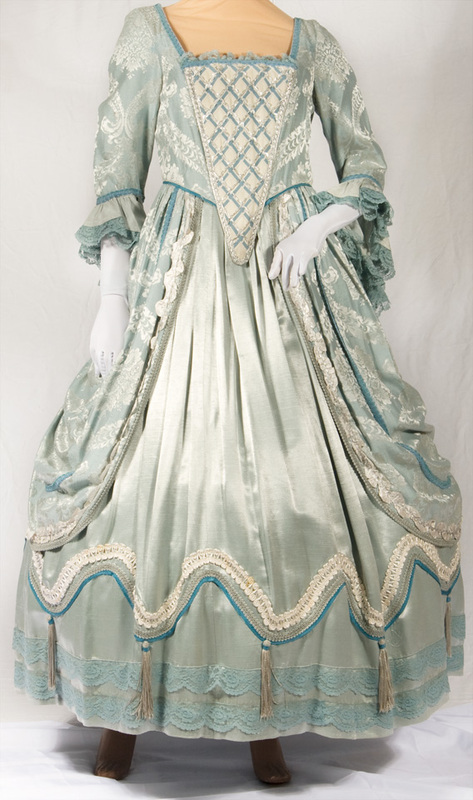 Includes: Silver & mint green 2 piece gown trimmed in silver. Very fitted bodice has center front lacing & panes cut at waist. Mutton styled sleeves with cream satin embellishments. 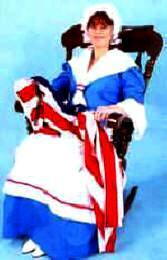 Includes: Two piece gown is made of royal blue & red striped & figured cotton on a beige background. 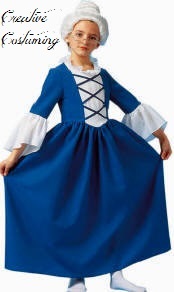 underskirt & stomacher are royal blue cotton twill with blue braid trim throughout. Fitted bodice, square neckline with lace trim. 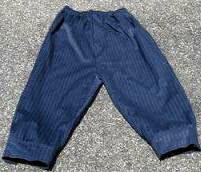 Short fitted sleeves with same striped fabric ruffle. Overskirt is caught up in panniers at sides. for size adjustment. 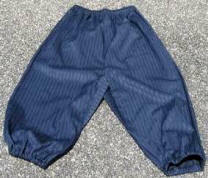 Includes knee length hoop slips. Bottom hoop circumference is appox. 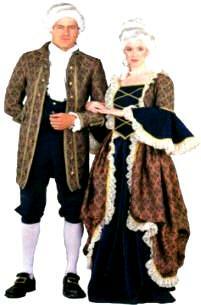 98"
Includes: Heavy duty Brocade Corset Jacket accented w/ruffled trim & back lace up closure, Long Satin Skirt & Hat. Includes: Top, long skirt & hat. 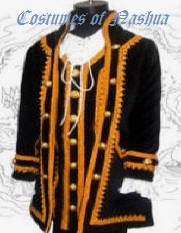 Includes: Handsome 3 piece ensemble includes jacket, full vest & breeches w/seam pockets accented with gold metallic buttons. shoe buckles, lace jabot and cuffs. 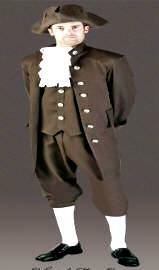 Includes: Long Jacket heavily detailed with gold braid trim, contrasting vest accented with gold braid trim, matching knickers, period style jabot & cuffs. Includes: Navy gabardine jacket w/tan collar, lapels, cuffs & pocket flaps, all trimmed w/brass buttons, matching tan vest & knickers.  (extra care should be taken with the blue jacket). 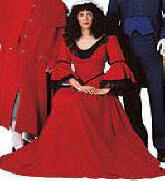 Includes: Red coat with blue trim and gold braid. C: 41" / W: 36"
Includes: Red Gabardine jacket & pocket flaps, blue collar, lapels, cuffs, & white vest all trimmed with brass buttons, & white knickers. 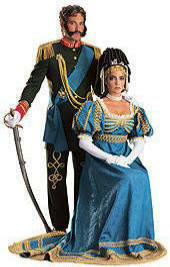 Rental include: Colonial full sleeved shirt, jabot neck piece, stockings, shoe buckles & Tricorn hat. Wig, gun & gloves are optional. shoe buckles & Tricorn hat. Includes: Red Jacket, Tan Vest & Knickers. 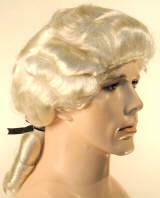 Rental includes White Shirt, Tricorn Hat & Lace Jabot. 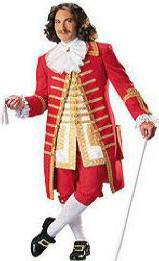 Includes: Red Jacket, White Vest & Knickers/Breeches. Rental includes White Shirt & Lace Jabot. Includes: Red Jacket, White Vest, & Knickers/Breeches. 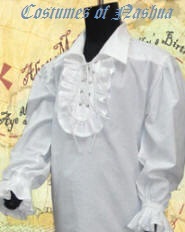 Includes: Handsome Jacket, White Vest & White Knickers/Breeches. 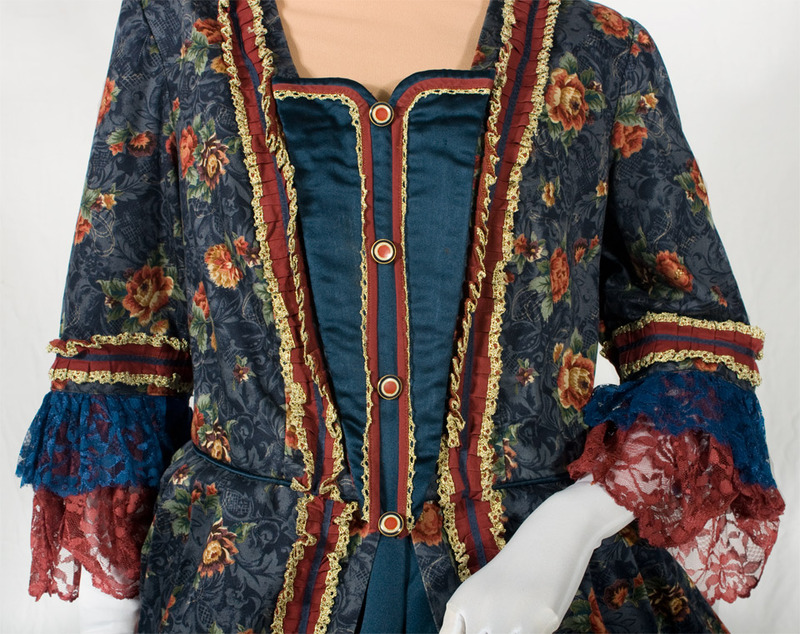 Includes: Red/Blue Jacket, Tan Vest w/attached Jabot, & Knickers/Breeches. 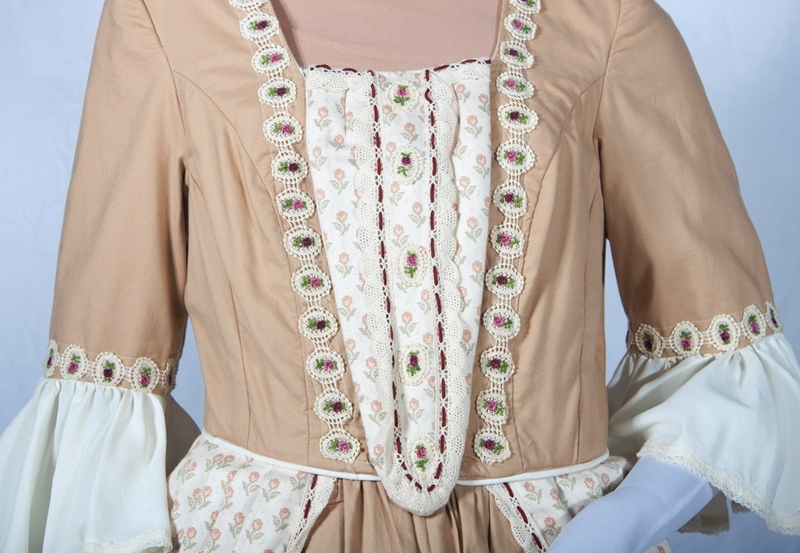 Includes: Red/Blue/Tan Jacket, Tan Vest w/attached Jabot, & Knickers/Breeches. white vest & white knickers. 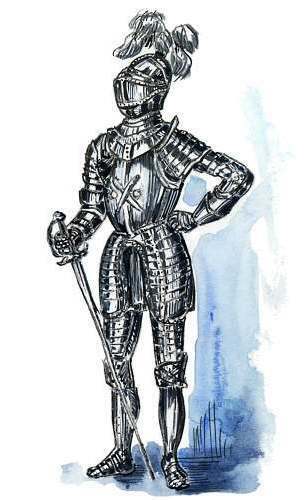 Includes: Jacket, shirt, pants, belt, cloak, scarf, pants and boot spats. Includes: Black cotton vest w/gold metallic trim, white cotton shirt & lace jabot, black elastic waist knit pants, socks, and black vinyl belt. Shirt Front, Lace Cuffs, Lace Jabot & Stockings. at elbow with lace braid. 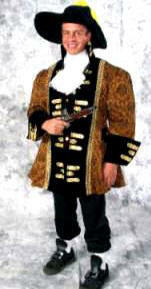 Includes: Black velvet frock coat with stand collar & silver trim. Ruby red attached vest front, coat lining & cuffs with flocked black brocade, black knickers & lace jabot at neck with matching lace at cuffs. 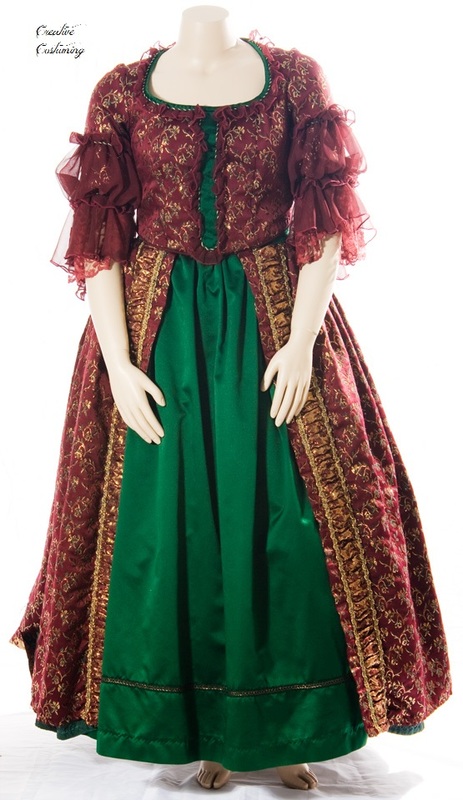 Includes: Hunter Green Velvet Dress with Metallic Gold Brocade Overskirt trimmed with white lace at neckline and sleeves. 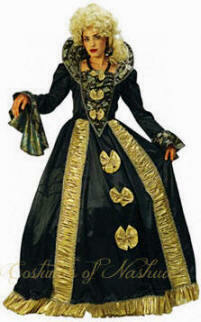 C: 40" / W: up to 38" / AS: 17"
C: 42" / W: 38"
Includes: Black & Green Brocade Jacket accented with Black Trim. Green & Black (Reversed Brocade) Vest & Black Satin Knickers. C: 44" / W: 38"
C: 42" / W: up to 40"
Includes: Gold and burgundy stripe brocade jacket with burgundy moiré vest and knickers, cuffed shirt and lace jabot. C: 44"-46" / W: 38"-41"
C: 38" / W: 32"-34"
C: 38"-40" / W: 32"
Includes: Beige/Gold Brocade/Jacquard Jacket with matching Knickers & satin vest. 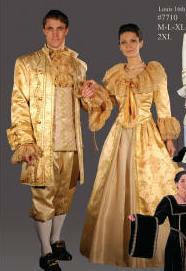 Includes: Chartreuse/Gold brocade cutaway coat with matching satin vest and brocade knickers. 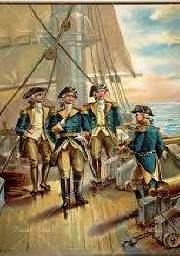 C: 44" / W: 38"-42"
C: 44" / W: 36"-39"
Titanic Captain, Foreign Royalty, Foreign Dignitary or British Naval Officer. 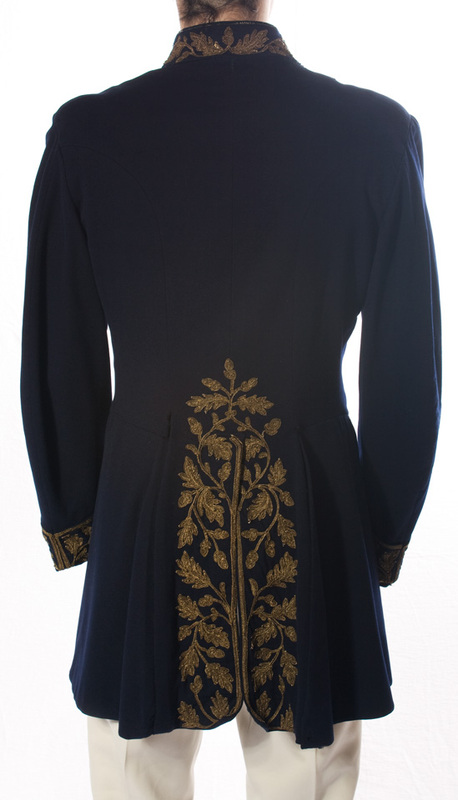 Includes: Double breasted Navy Military style jacket with gold embroidered trim on cuffs and center back, Princely. C: 40" / W: 32"-36"
Works for Colonial or Victorian. school book reports & projects. 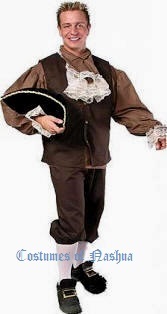 This costume also works for Pilgrim or Amish. Size: S (4-6), M (8-10), L (10-12). Great for school book reports & projects. 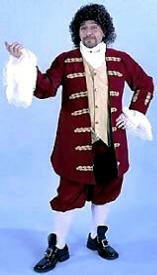 Include: Burgundy velvet jacket & knickers, black shirt w/lace collar & sleeves. Include: Black velvet jacket & knickers, white shirt w/lace collar & sleeves. 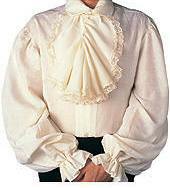 Includes: Black velvet jacket, vest & knickers, separate white lace jabot & sleeve cuffs. jabot & hat. Made of twill like polyester. Great for book presentations at school. 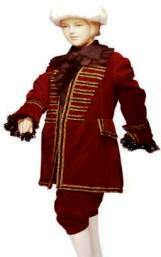 Includes: Burgundy pants & vest with attached sleeves and lace jabot. Made of twill like polyester. shoe buckles & lace jabot. w/gold trim, tan knickers & vest w/gold button detail & attached white ruffled Lace Jabot. Third president of the United States, founding father & a framer of the Constitution. 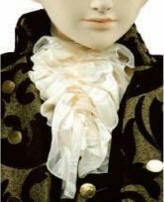 Includes: Green colonial style jacket w/attached vest, breeches, white ruffled lace jabot & cuffs. 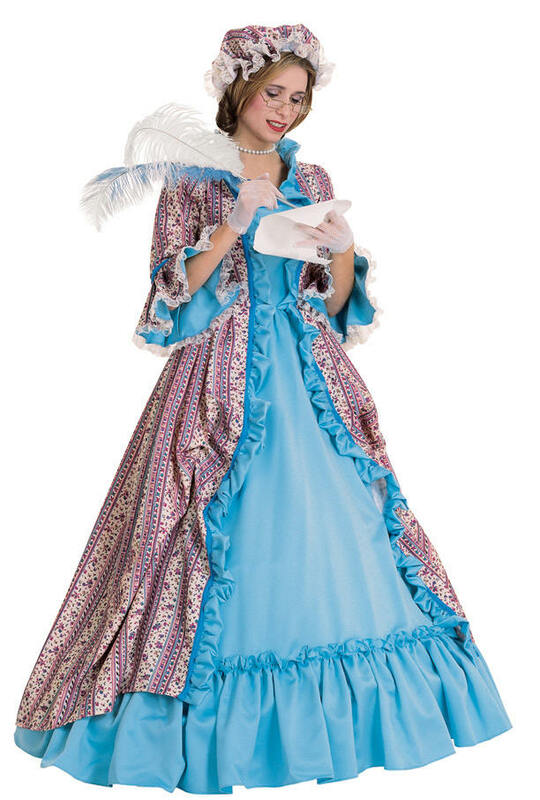 Includes: Pink period style gown accented w/light blue ruffles on the bodice, above the hem, on the full length skirt & on the fitted sleeves. neckline w/subtle white lace trim & large bold wide lace cuffs at end of sleeves. Includes: Blue Jacket, Tan Vest & Knickers. tricorn hat & lace jabot. Includes: Black Jacket, Pants & Grey Vest. Rental includes White Shirt, Hat & String Tie. Includes: Pair of vinyl flaps with elastic band & metal buckle. Faux Leather (PU) Colonial / Pilgrim Loafer Shoe w/Large Buckle, Fabric Lining & Padded Foot Insert. Rubber soles & 1.25" heel. 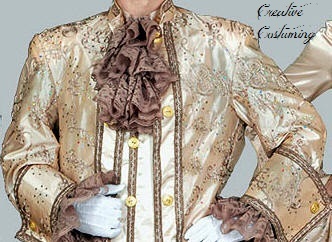 Includes: Dashing double breasted jacket w/tails opulently decorated w/gold trim, trousers w/seam pockets, sash & pin. Includes: Cotton print blouse, skirt, peplum, contrasting belt, white cotton ribbon shawl, and black cotton bustle worn under the skirt. Sword shown is not available. Headpiece shown is not available. 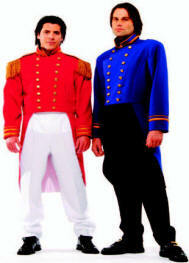 Includes: Military cut jacket w/attached epaulettes & contrasting collar & cuffs, lanyards (cording), imperial sash & matching pants. 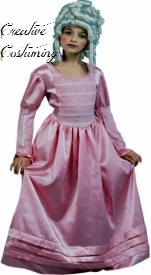 Includes: Satin gown w/lace trimmed neckline, puff sleeves & flowing train. All heavily detailed w/gold metallic trim. 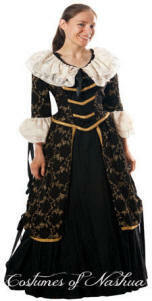 Includes: 3 pc brocade & lace coat w/attached vest, matching knickers & belt w/gold buckle. Pants are cut to be worn low on the hips. Includes: Skirt, blouse, peplum, belt, scarf, and hat. 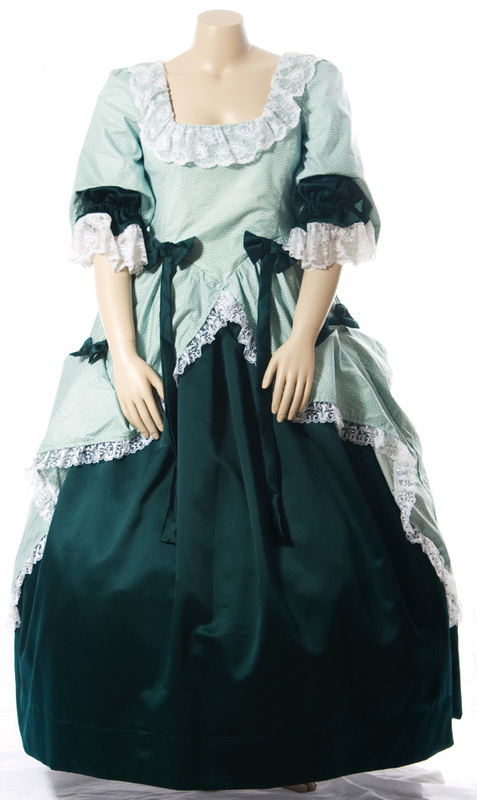 Includes: Poly-garbardine dress with overskirt and matching mobcap. 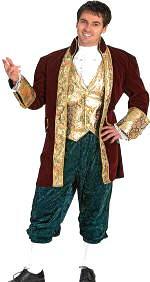 Include: Burgundy Velvet Jacket with attached Gold Brocade Vest Waistcoat, Hunter Green velvet knickers & Lace Jabot.